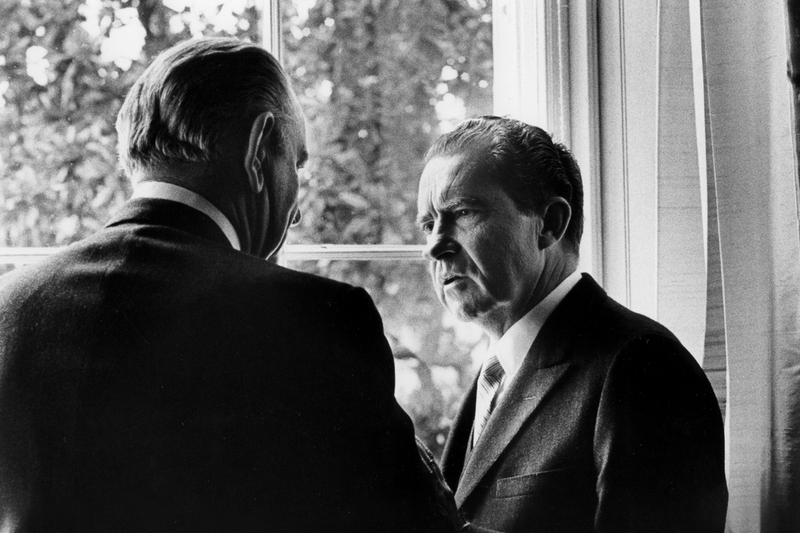 In his recent book Richard Nixon: The Life, journalist-biographer John A. Farrell claims to have found a hitherto overlooked document that proves the contention that Richard Nixon, as a presidential candidate in 1968, subverted President Johnson’s plans to begin peace talks with the North Vietnamese government in Paris. Mr. Farrell states that this “may be more reprehensible than anything Nixon did in Watergate.” This very serious charge has been almost unanimously and uncritically accepted by the book’s reviewers, and by many reporters and writers. But an alternate interpretation of the Haldeman notes, one more rooted in their actual words and the context in which they appear, supports a different interpretation, and indicates that Mr. Farrell has misinterpreted the document and overreached in his conclusions about it. The document Mr. Farrell found in the archives of the Nixon Library in California, comprises four pages of handwritten notes made by Haldeman during a telephone conversation with candidate Nixon late on the night of October 22nd, 1968. Earlier that day, Nixon had received a memo from Bryce Harlow, a Washington insider known and respected both for the quality of his judgment and of his wide-ranging contacts. The Harlow memo contained startling and disturbing news from a source high inside the Johnson White House. From the start of the 1968 presidential campaign, President Johnson had promised the competing candidates (Republican Nixon, Democrat Vice President Hubert Humphrey, and Independent Party Governor George Wallace) that he would treat them equally, and that he would not do anything to influence the outcome of the election. He had repeated these assurances as recently as the week before, in a conference call on October 16th. On that call, LBJ also repeated his insistence that the North Vietnamese must meet the three preconditions he had laid down before any bombing halt could be considered (to stop shelling cities in South Vietnam, not take advantage of the halt to infiltrate the DMZ, and agree to negotiate with the South Vietnamese government in Paris). And he instructs Haldeman to have Harlow tell Republican Senate Minority Leader Everett Dirksen, who would dependably convey the message to Johnson: “if don’t get 3 conditions N [Nixon] will blast bomb halt”. Haldeman quotes Nixon: “They’re selling out SVN [South Vietnam] – leave new admin [administration] to handle / make a communist Asia”. Suddenly armed with knowledge of Johnson’s secret plans thanks to Harlow’s memo, Nixon wants his friend, Florida businessman Bebe Rebozo, to contact Florida Democratic Senator George Smathers and have him let LBJ know that “N is going to blast him – the bets are off & N very disappointed”. The section of the notes on which Mr. Farrell bases his charge that Nixon intended to “monkey wrench” Johnson’s plans for peace talks in Paris is headed: “re V.N. bomb halt news”. -any other way to monkey wrench it? The “V.N. bomb halt news” was Harlow’s memo. Everett Dirksen was the Republican Senate Minority Leader; John Tower was a Republican Senator from Texas. Nixon’s efforts were unavailing. Nine days later, five days before the election, and without the North Vietnamese having agreed to the three conditions, President Johnson went on TV and announced a bombing halt. Despite the clearly stated context in which the “monkey wrench” appears (“re V.N. bomb halt news”), Mr. Farrell interprets the question “any other way to monkey wrench it?” as referring to the new round of Paris talks that would follow the announcement of the bombing halt. In all four pages of Haldeman’s October 22nd notes there are no references to talks with North Vietnam or to Paris. The context of Nixon’s “monkey wrench” question is clearly the news that LBJ was planning to announce a bombing halt, and the thrust of all Nixon’s instructions is to dissuade him from doing so without the North Vietnamese guarantee to abide by the prerequisite preconditions. In fact, aside from Mr. Farrell’s mistaken “monkey wrench” claim, there was no “peace plan” to scuttle. The U.S. and North Vietnam had engaged in desultory meetings in Paris for years. The Soviet Union, to prevent the perceived anti-Communist Nixon becoming President, had recently been pressuring the North Vietnamese to agree to terms before the U.S. election. But nothing palpable had resulted from that intervention, and the Paris talks remained bogged down by North Vietnamese intransigence until the end of 1972. Of course, Mr. Farrell is entitled to his interpretation of the Haldeman notes, and the conclusions he draws from them. But the alternative interpretation, if nothing else, more clearly reflects the context of the actual Haldeman document. Therefore, it deserves consideration before accepting Mr. Farrell’s interpretation, and the very serious charge he bases on it. What candidate Nixon wanted to “monkey wrench” in the last weeks of October 1968 was LBJ’s determination to announce a bombing halt whether or not the North Vietnamese met the President’s long-standing preconditions. Nixon, in his own words recorded by Haldeman in these notes, thought that kind of bombing halt would be militarily disadvantageous, diplomatically dishonorable, and strategically disastrous.